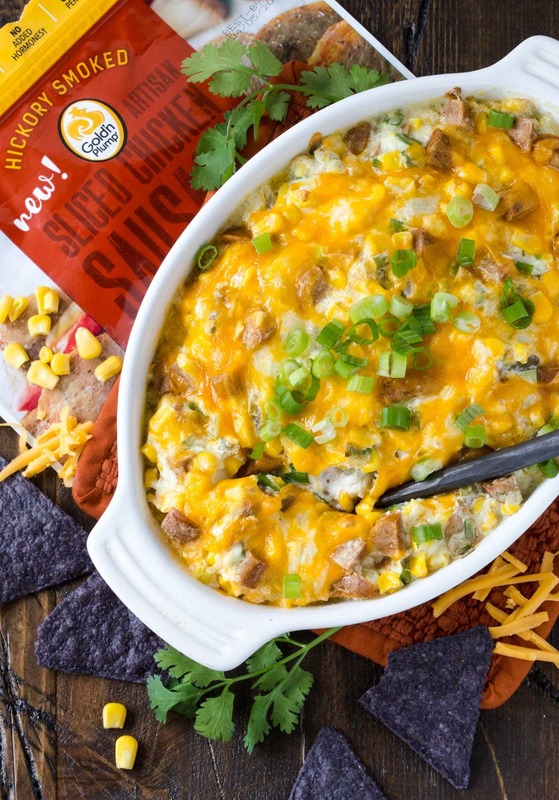 Whether you’re a die-hard football fan or just like to hang out and enjoy good game day grub, you’ll score big with this Zippy Sausage and Corn Dip at your next pigskin party. Football parties are just as much about the food as they are about the final score. 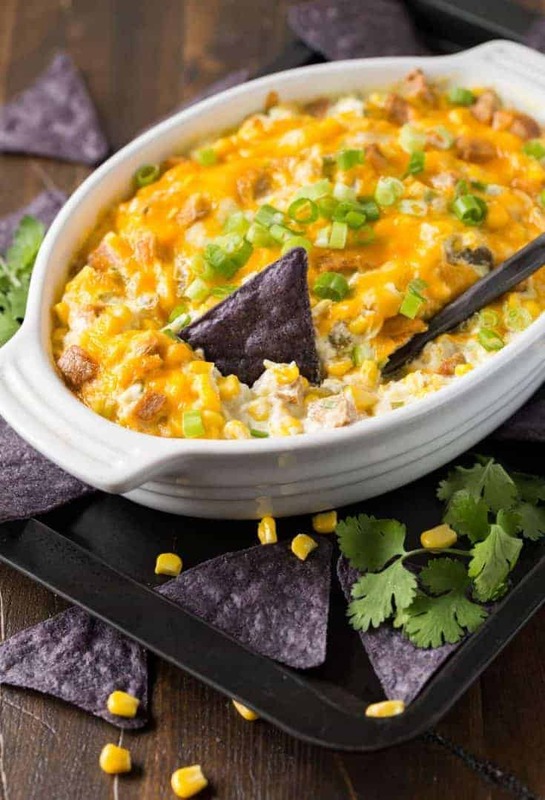 In our house, finger foods and appetizers rule on game day, and this Zippy Sausage and Corn Dip is the latest fast and flavorful addition to our tailgating menu. We’re always looking for shortcuts and products that help us make entertaining easier, so it was a no-brainer for us to use Gold’n Plump® Sliced Chicken Sausage in this Zippy Sausage and Corn Dip. Their fully cooked chicken sausage slices are made from chicken raised with No Antibiotics-Ever and contain only real ingredients (none of the fillers and artificial flavors like other products). Plus they are sold frozen in resealable bags so all you need to do is take out the amount you need and pop the rest back in the freezer for another use. Super convenient! Another reason we love this Zippy Sausage and Corn Dip? It requires very little prep work. Aside from chopping a few green onions and cooking the Hickory Smoked Sliced Chicken Sausage, the rest of the recipe is truly dump and stir. Plus it can be made in advance and kept refrigerated. Simply fire up the oven about a 1/2 hour before guests arrive, and they will be greeted with an irresistible aroma when they walk through the door. 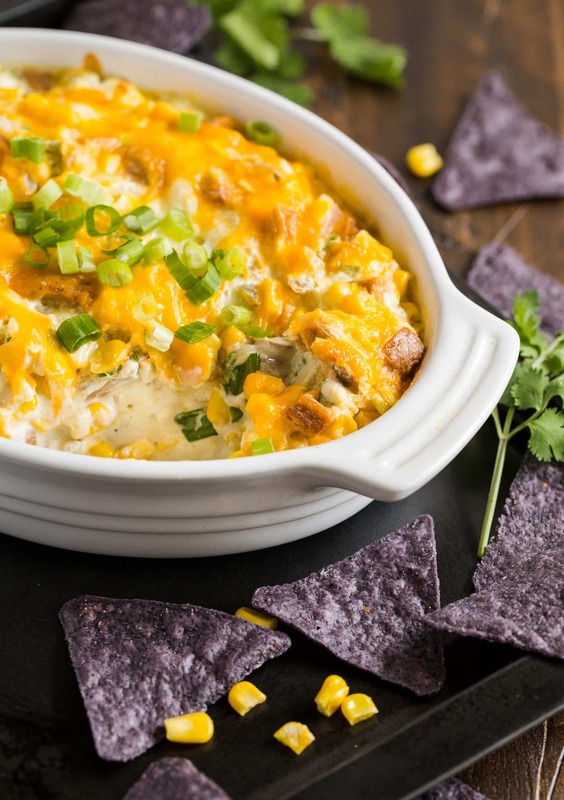 Tip: The mild heat in this dip comes from diced green chiles and pepper jack cheese. Craving more spice? Add some minced fresh jalapeño peppers. Or stir in some chopped chipotle peppers in adobo sauce. Not a fan of heat? Dial back the pepper jack and use mostly cheddar and/or Monterey Jack cheeses instead. Craving more football food? Don’t miss our recipes for Chicken Parmesan Sliders and Pesto Meatball Flatbread, also made with Gold’n Plump products, as well as other recipes for both flavors of Gold’n Plump’s Sliced Chicken Sausage on their website. Or you can connect with them via social media including Facebook, Twitter and Pinterest. Disclaimer: This post was sponsored by Gold’n Plump. All opinions are our own. Thanks for supporting the brands that make Garnish with Lemon possible. Prepare sausages using desired cooking method on package. Cool and coarsely chop sausage slices. In a large bowl, stir together cream cheese, sour cream and shredded pepper jack cheese. Add sausage, corn, diced green chiles and green onions to the bowl and stir until well mixed. Pour into greased 1-1/2 quart baking dish. Sprinkle with 1/2 cup cheddar cheese. Bake for 25-30 minutes or until bubbly around edges. Garnish with additional green onions and chopped cilantro, if desired, and serve warm with tortilla chips. You can prepare this recipe through step three up to 12 hours in advance. Cover tightly and refrigerate until ready to bake. You might need to add a few extra minutes to the baking time since it will be cold from the fridge.